I think I love him! 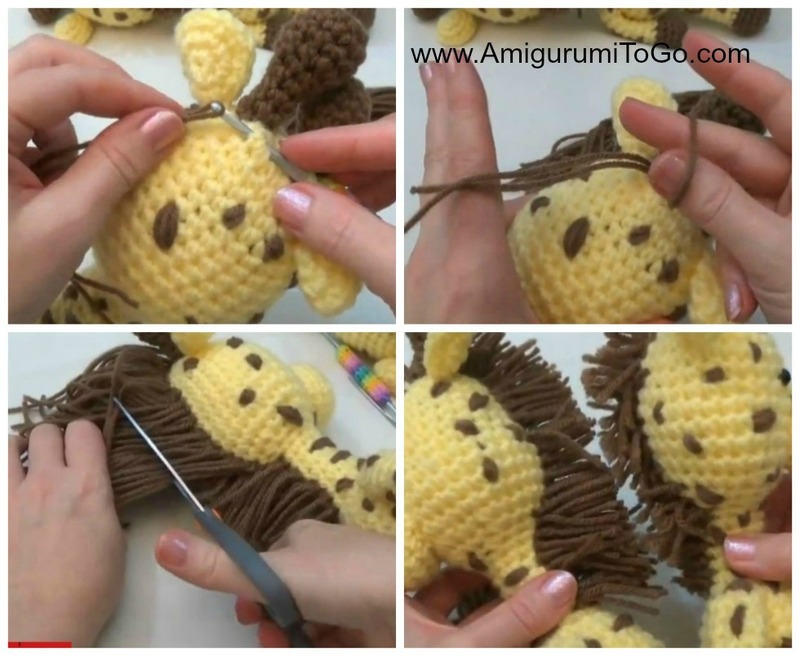 One more Little Bigfoot pattern gets revised, updated and given it's own video tutorial. SPOTS: Depending on the colors you choose, you can add in the spots as you go along but if you use yellow with brown spots then it's best to add in the spots after the doll has been stuffed and closed. I show how to do both methods in the video tutorial. View video at 12:51 for how to add them before it's stuffed and hear the reasons why it might be best to wait until it's stuffed and view at 28:04 on how to add in the spots after the doll has been stuffed. 38) 2tog twice and f/o. Weave yarn tail in and out the remaining stitching and pull tight to close the gap. Knot off and hide yarn tail in body. You can add in some spots now. View video at 34:30 for tips on adding in the spots. sl st next st and f/o leaving a long tail for sewing. You can add in a mouth and nostrils before sewing muzzle to head. Sew most of the muzzle in place then stuff before sewing on completely. sl st next st and f/o leaving a long tail for sewing. *stuff the ball part of the horn. Leave the stem of the horn unstuffed. sl st next st and f/o leaving a long tail for sewing. Fold ear and then whip stitch the one end. It takes only 2 stitches to hold the ear shape. sl st and f/o leaving a long tail for sewing. Stuff & shape foot (tips on stuffing at 59:54) stuff leg. 2) sew on the legs. I sewed them on in a way the doll stands up. 4) sew on the muzzle (top of muzzle sits just above the 11th row). 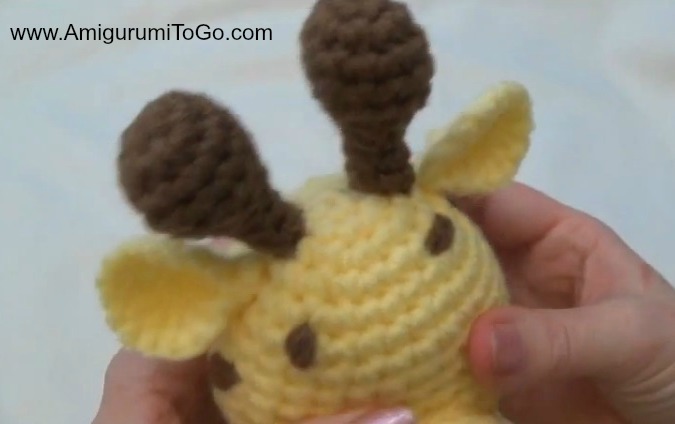 5) sew on the horns (the space between them is up to you) then the ears 1 row below the horns. 7) add in the nostrils, mouth then the eyes. I put the eyes in between the 9th and 10th. Hope you enjoyed this pattern, come back soon for more Little Bigfoot patterns! I don't mind you translating the pattern. Would there be anyway to make the translation public? I could post it here with credit to the translator or provide a link to the translation? Thank you so much for your patterns of the little big foot animals. I am making an elephant, monkey and hippo for my niece's baby, The comforter is in the jungle theme. They are so cute. Your tutorials are so helpful and so well done. Thanks again! thank you so much for your lovely patterns!!!!!! Thank you so much for this (and all your tutorials, I can't stop looking at them)! 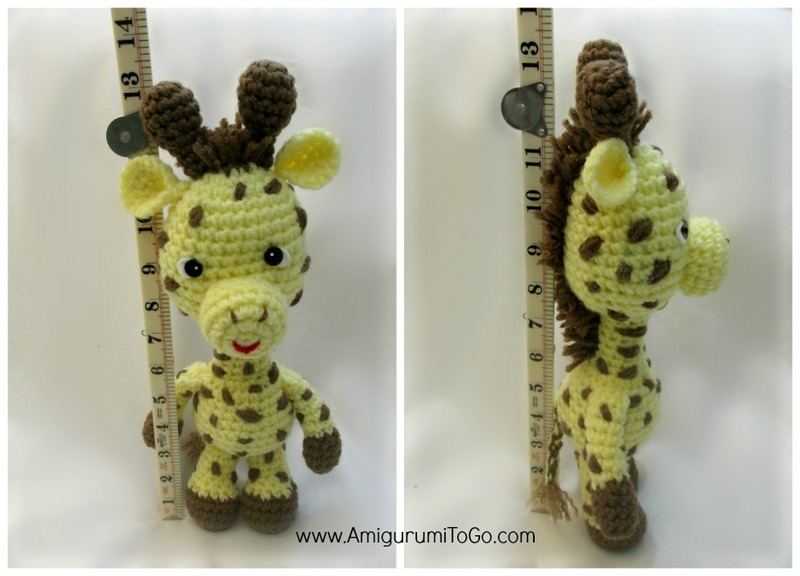 I have a question.. if I'd like to make this giraffe into an unicorn (or horse) how many rounds do you recommend for the neck ? Do the spots on the giraffe come from variegated yarn? or do you switch to brown yarn randomly? Or....what? 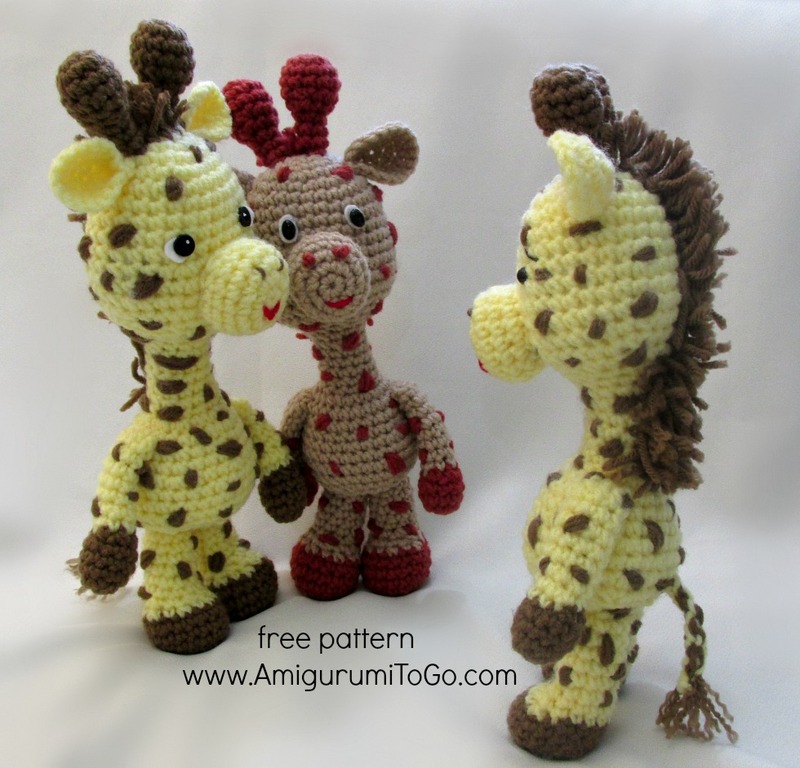 I have made 5 or 6 of these gorgeous giraffes. I'm getting faster too. LOL I can now make the head and body in 2 1/2 to 3 hours. (for me, that's good). In the pattern and the tutorial, you put pipe cleaners in the neck to keep it somewhat rigid. I tried that and was really disappointed with the result as the head flopped about. My husband came up with what I think is a brilliant idea. Instead of all stuffing in the head, he suggested a little stuffing first, then a polystyrene foam ball so the head keeps its shape but is lighter. Then to keep the neck rigid, he made me some loops of stainless steel wire to use. I put a slit in the bottom of the foam ball and pushed in the part of the wire loop that was bent over to avoid scratching anyone, then a few drops of glue to hold it in. Voila! The results are VERY pleasing to me. The loops are about 3 1/2 inches long and about 3/4 of an inch wide. We tried aluminum wire, but too much bending and it breaks. 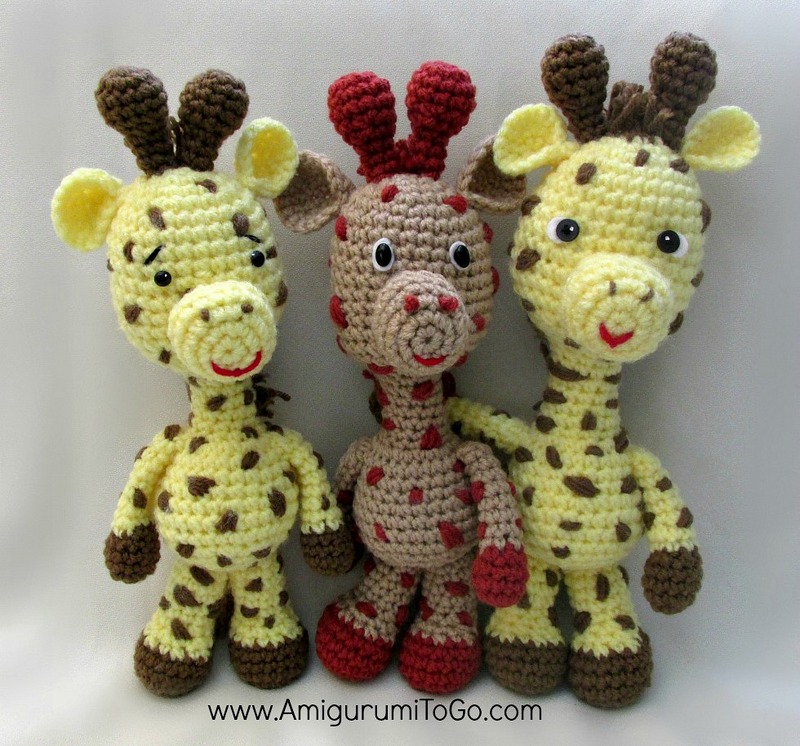 Vim agradecer e aproveito para deixar o link do meu Blog, para você ver a Giraffe Crochet que fiz......baseada em sua vídeo aula, que é muito bem explicada!!!!!! Bjs!!!!! did you try following along with the video? Your the best instructor i have ever watched, thanks to you i understand so much better. It was like a light bulb coming on. I can't thank you enough. Forever grateful , Nora. I was wondering if you have plans for a bigfoot puppy? My granddaughter loves your bigfoot ami's and has been asking for a puppy. thank you for all the wonderful patterns. Hi, Sharon. This giraffe is absolutely adorable! 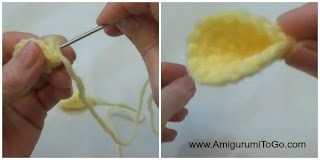 I was wondering approximately how much yellow yarn is needed, as I would like to have a go making sure I have enough yarn before I start. Thanks! 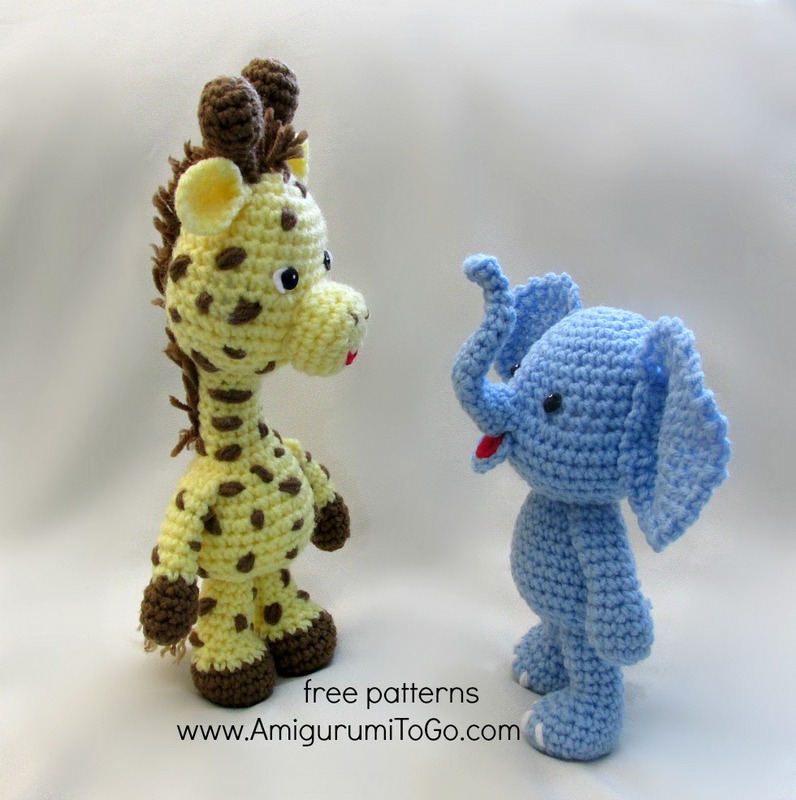 i made these giraffes and they are seeming to get smaller every time but i am following the same pattern did you change anything or do you have any tips on how to fix this? nope, didn't change anything. Could you be using a smaller hook or lighter weight yarn? Those 2 things could make the item smaller. I loved this pattern. I made two: one joining rounds and the other as written. i tend to modify patterns due to the fact that I rarely repeat the same proyect twice but I love that the head neck and body is worked as one piece. Gonna work on the Little Bigfoot monkey later on. Thanks for your awesome patterns! Is it better to add the spots as you stuff or wait and do the spots last? it's been over 2yrs since I made this guy so I can't tell you for certain off the top of my head, I just don't remember but it's all in the pattern. If you scroll up, just above the start of the written pattern,(where it says in red, "Starting at the top of the head working down to bottom of body"), just above that there's a photo, look above that photo with the heading in red "SPOTS", I give some tips there. Then again at the bottom of the body, in row 38 I give more advice and also list a time in the video that will be helpful for adding spots. i want to make him bigger, if i use a bigger hook will that make him bigger? or just mess up the patteren? These are so cute, and so perfect for little arms to hold and little hands to drag around! So sweet of you to share the pattern. Hey love your videos and would love to show my work to you but can not find you on facebook. You can find me at cindy slaughter butler.